Noggin Clontith as he appears in the "You've been gnomed!" video. The Adventures of Noggin Clontith were two animated films based on Noggin Clontith, a walking talking gnome. 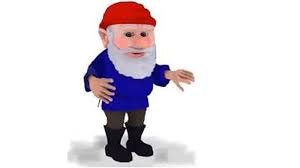 This gnome had been turned into a meme in September 2018 (with origins from 2016) after a video of him saying "I'm gnot a gnelf, and I'm gnot a gnogglin! I'm a gnome, and you've just been gnomed!" was shared onto YouTube back in 2010. The video is very popular and is (possibly) the only reason people know this gnome exists. The two films are very obscure. "Oh, hello chum! I'm Noggin the gnome! Welcome to my website! Here you can find storage, songs and [inaudible] with animation! And you can send them to your chummers, have yourself and a chum in a picture with me! Come on, NOGGIN with NOGGIN!" The site also has a page about the creators of the character, games, and the ability to "send a Noggin", presumably something like the "You've been gnomed!" video. However, there is one page that is not accessible, that being the shop page. When looking, you can see that two films were made based on Noggin, Volume 1 and Volume 2. Not much has surfaced of Volume 2. However, Winstanley's portfolio website depicts two screenshots of unidentifiable origin, and it's unknown if they're from Vol. 1 or 2. Due to the fact that Angela Winstanley seems to have abandoned Noggin Clontith, it's possible she may not even have any copies of the DVD anymore. However, the film DOES have a couple clips existing on Winstanley's YouTube channel. It seems to have never been completed or released, as barely any info can be found on it other than the clips. As for Volume 1, it can be purchased on Noggin's new website.